When your customer offers Free one-day shipping, the pressure is on to ensure that their DC is the model of efficiency. It makes sense then to use pallet flow rack as part of the material handling solution. 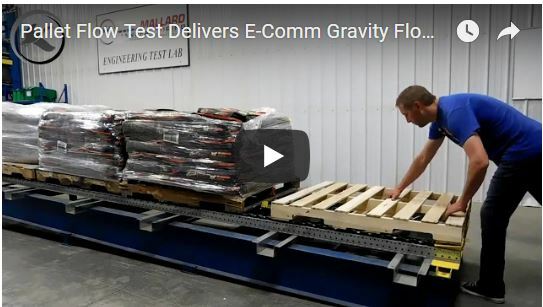 Pallet flow is a gravity flow solution that is dependable, low-maintenance, easy-to use and can be designed to handle all types of inventory in a variety of warehousing applications. Pallet Weights 930 – 2030 lbs. Our engineers were supplied four loaded GMA-style pallets of varying weights from 930 – 2030 lbs. The product for the test was heavy plastic bags of kitty litter that were piled and shrink wrapped onto the pallets. A little messy, unwieldy and therefore a great product for processing in a controlled, minimally man-handled manner like a pallet flow lane. Our team used 3 rails of Magnum wheel pallet flow to design the lane. They added speed controllers at 56” intervals to control the flow of the pallets and the tracking down lane. Lastly, they added the Flex Separator FS-200 to the lane configuration. The flex pallet flow separator ensures that the front pallet remains isolated from weight of the rear pallets. If the front pallet is free from back pressure, then it is easier and safer to pick. 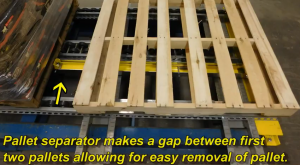 As you can see from the test video, the flex separator automatically engages once the front pallet flows into position and is easily released to advance the rear pallets once the front pallet is picked. Just like this scenario, our engineers can customize the perfect pallet flow lane for your material handling applications; however, we do have a few notes to ensure maximum efficiencies. The pallets supplied for this test were in rough condition. 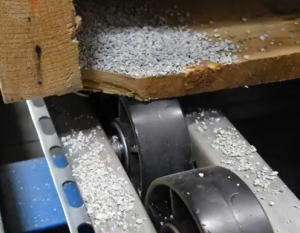 It’s not just pallet flow that can hang up with broken or splintered palletized product… in general pallets in poor condition pose an overall safety concern for workers and inventory. Worn pallets should be refurbished or recycled before they break. 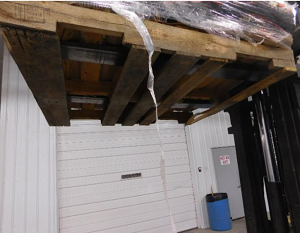 We also noted plastic wrap dangling down on 3 of the 4 pallets. 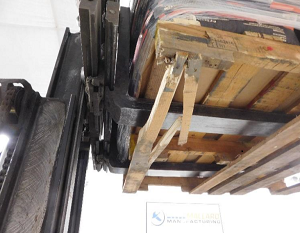 Loose wrap is again another overall safety concern so never load a pallet onto a pallet flow or any other dynamic system if the wrap is hanging. Forklift drivers should quickly scan the load first. Loose or granular product in plastic bags can leak… so, do a regular once- over of your pallet flow lane to sweep away any loose material and especially when there is a known product leak. These are quick fixes and preventions to keep the material flowing in and out of any busy DC. In this case the old adage, “An ounce of prevention…” really can be worth its weight in gold if it keeps customers happy and coming back again and again. Consider pallet flow for your next e-commerce project. Pallet flow can be fitted into new or existing pallet rack and don’t forget our testing lab where we can test out your solution to ensure we’ve gotten it just right prior to installing. Just give us a call and we’ll get started.